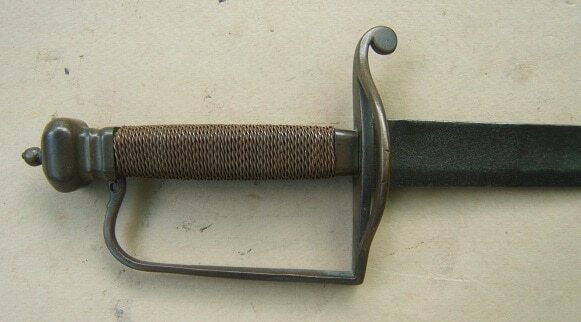 A VERY GOOD+ UNTOUCHED AMERICAN REVOLUTIONARY WAR PERIOD AMERICAN BLACKSMITH MADE “CHARLEVILLE”/”COS” MUSKET BAYONET, ca. 1770s: In overall very good+ untouched condition. Tapered, blacksmith made, somewhat crudely forged, narrow, flat, triangular, 12 1/4″ x 1”, unmarked blade of classic Hand forged craftsmanship and form. 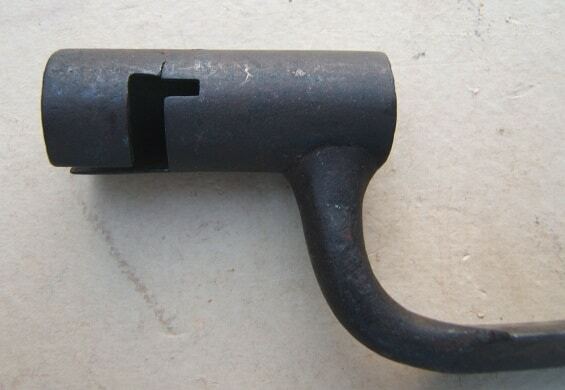 Wrought-forged, open ring applied socket– for a top-lug-mounted bayonet-lug with a “Z” shaped lug-slot and richly toned/patinated, steel surfaces with some scattered light discoloration/fine pitting (minor hairline at slot). In overall very good+ untouched condition with generally sharp contours and a fine point. 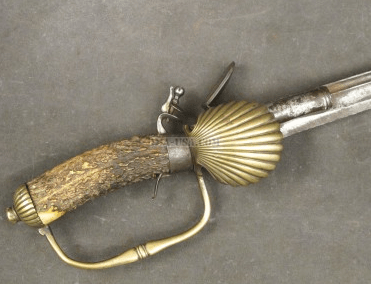 A nice example of an American made Revolutionary War Period “Charleville”/”COS” Musket Bayonet, ca. 1770s. Overall length, 15 3/4″.